We offer dustless floor sanding, and refinishing without the toxic fumes. We pride ourselves on using quality products and the most state-of-the-art equipment the wood flooring industry has to offer. The water based finishes we use are extremely durable and offer the beauty of an oil finish in a water based formula. Why is this significant to you? It gives you the sought after amber tones of an oil coating without the lingering odors and long dry times that leave you without use of your home. Because our finish is a water based formula, it doesn't have the flammability issues of solvent based coatings and is friendlier to your home environment! Your floor can be walked on with stocking feet in 24 hours, and furniture can be placed (not dragged) in 48 hours (Drying times may vary). Area rugs can be put down in 10-14 days. 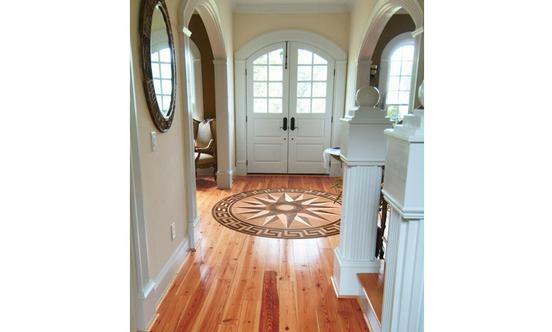 We offer a wide selection of both exotic and domestic hardwood flooring including many hard to find exotic species. Let us transform your space into incredible ones with a custom floor design using borders, inlays or medallions. The possibilities are endless! 2018 Copyright. ShenValley Floors, LLC All Rights Reserved.